On this day of solemn remembrance, it is only fitting we honor all the heroes of September 11, 2001. This year the last surviving search and rescue dog who responded passed away. Bretagne (pronounced Brit-nee) along with hundreds of other search and rescue dogs helped scour the wreckage for survivors in both New York and DC. These canines worked tirelessly alongside emergency service workers to save lives. Appollo, a search and rescue dog of the New York Police Department and his handler arrived fifteen minutes after the attack. While working the German Shepherd was struck with flaming debris and would have died if not for a chance fall into water moments before. He continued to work after his handler brushed the debris from him. Jake, a black Labrador Retriever and member of the federal search and rescue team, served for seventeen days searching among the debris. 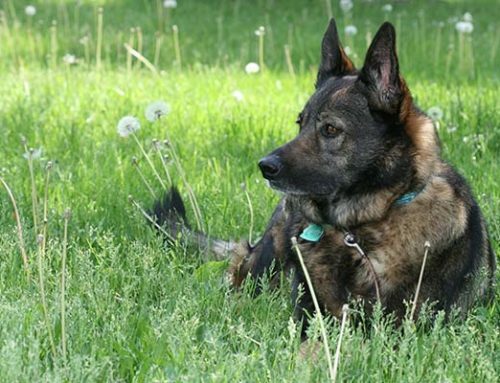 Trakr,1 a Canadian police dog, found the last survivor of the attacks on September 12th but continued to work until September 14th when he collapsed from chemical and smoke inhalation, burns, and exhaustion. These are just a couple of stories of the noble and valiant efforts made by the search and rescue dogs that day. However, they are not the only canine heroes. Two guide dogs, Roselle and Salty, received the Dickin Medal for bringing their owners who were inside the World Trade Center during the attacks to safety. There was also one canine fatality during the attacks. Sirius, a bomb-detection dog, was on-duty that day and did not make it out of the towers. In the aftermath of the attacks, dogs continued to help for weeks and months providing comfort. The Good Dog Foundation helped ease distress providing the unconditional love of canines to the victims at the Pier 94 Family Assistance. Therapy dogs such as Fidel, a Papillion, consoled families who returned to Ground Zero. Tuka, a Chesapeake Bay Retriever helped Emergency Medical Technicians cope with the overwhelming tragedies they witnessed. Twenty, a Dalmatian, helped Ladder 20 cope with the loss of seven of their own. As we remember the tragic events of the day and the heroism of so many, take a moment to remember the four-legged heroes as well. Main Image: 9/11 Memorial Pool by Norman B.
I’m about to cry. Thank you for your reminder of how vital dogs have and are to us, especially in desperate times.